Stefano Trabucchi was born on Febbruary 5th, 1970 in Sondrio Italy in a family of musicians. When I was 8 years old I started to play the violin and, since then I’ve been attracted and fascinated by this instrument and consequently by lutherie and its secrets. That’s the reason why, at 14, I enrolled in the International School of Lutherie “A. Stradivari”, where I graduated in 1988 gaining full marks. Immediately after the diploma, I integrated in Master Nolli’s workshop where I learned all the tricks of the trade. As I finished my internship in 1992, I opened my own workshop at Via Bella Rocca14, in the centre of Cremona. Here, by practicing constantly, I’ve improved and perfected my skills, in particular as for the construction of the classical quartet (violin, viola, cello). 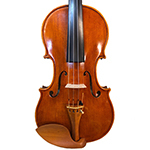 I’ve also made some Baroque instruments, such as a pochette (directly inspired by Stradivari’s models) and violas d’amore. 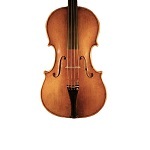 Stradivari’s tradition, its features and models are my main inspiration. In addition to traditional modern instruments, I’ve focused my production on making copies of ancient instruments. My creations are appreciated worldwide, especially in the USA, Japan, Germany, and Italy of course. My company is a sole trader and registered at the Craftsmen Register of Cremona Chamber of Commerce.